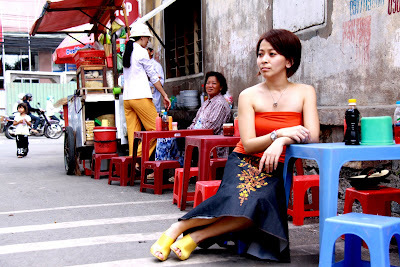 It's been a while and I know I owe everyone some stories about my Saigon life. After a month of being here, I think I already gauge some of my emotional concerns. First of all I want to tell you guys that I am truly happy where I am now. Although it's not easy as the days passed by, I am surviving and now I am glad to tell that I survived my one month. Everyday is an adventure filled day---I don't know what's going to happen, it did surprise me in a good way and some in a bad way. But I don't want to spoil everything, let me start telling the good things first. When I landed at Tan Son Nhat International Airport around 8:30 am Saigon time, I didn't feel that I am a stranger. Everyday here is like a week of my life in Manila. Every week is like a month, so now I feel like I'm already here for four months. Things are happening so quick. No time to waste. To summarize my four weeks, lemme count the good points why I love Saigon. On my first day of work, my colleagues invited me for a coffee nearby. One of the guys gave me a ride using his motorbike going to the coffee shop. I braved and enjoyed that risky moment. Quickly a week after, the guy I rode with toured around and introduced me to his architect friend who owns a gallery or somehow she calls it an artist den. My colleague also bought me a helmet so that next time if I'll ride a motorbike taxi, I have my own. Since that day I only rode a motorbike taxi twice. It's quite expensive so I'd rather have an aircon cab than have myself exposed on dusty wind and get perspired. Speaking of perspiration, I rarely get perspired because I live in Phu My Hung. It's an outskirt from District 1 where all the busy motorbikes and a typical city set up but not too cosmopolitan as Makati. I love Phu My Hung because it's like a huge Salcedo Village in Makati where clusters of townhouses, condos and flats are situated. Mostly Koreans, Filipinos, Chinese and other expat nationalities reside in this area. From my place I usually ride the coaster bus everyday from Phu My Hung to Dong Khoi and from there I will ride a cab going to the office. It will take me 45 minutes to 1 hour to get there due to traffic. Living quite far from the office is actually a theraphy on my part. Strange at first but it's very rewarding when the bus finally enters the Phu My Hung area. It's like an escape from the busy city of Saigon. The only catch here, I should wake up early and be on time for the bus. Because if I miss the bus the next one will arrive an hour after. Precision is the discipline game. That's what I am learning so far. There are few malls in the city and none of them are as big as any of our SM supermalls. Movie houses? I think they have 3 good ones which are very similar to our Makati's finest. In fact I was able to watch "Angels & Demons" in one of those cinemas. By the way, I like that movie so much. When it comes to food, I terribly like their food. Tons of restaurants to dine, not just authentic Vietnamese food but of all sorts. Surprisingly, there are Jollibee food chains around the city. I haven't tried it though. I think the locals love Jollibee here but not as much as Lotteria. Maybe appreciate is the right word than love. Speaking of love, I love going to groceries and supermarkets here. I enjoy it and I cook as often as I used to. Here in Vietnam they also love to eat fruits---so now, I find myself eating fruits very often. When I was in Manila I rarely eat fruit. I think I gained a few pounds already not just because of eating a lot but sleeping a lot too. Haha! Proof to that: my waist expanded and my double chin is coming out already. Is it good or bad? Over-all, I'm loving it here. This is what I tell to all the people I chat from Manila. Well this is it for now. Actually, I still have more stories to tell but lemme find good visuals for that. Your waistline and your doubled chin are the solid proof that you're happy in Saigon; and I am glad you are. I've learned from you this morning: the essence of appreciating (the place?) more than loving. Great! By the way, binanggit nga pala kita, Joannie, sa isang post ko last 27May09- 'The Keynote...' (my entry to the 2009 Pinoy Expats/OFW Blog Awards). Hindi na ako nagpaalam pero hindi naman masama ang isinulat ko kaya sa tingin ko ayos lang. I am glad you are enjoying this exciting time. Good Wishes from Australia! Appreciating things first is important then you will eventually love it. Yeah I read that post. No worries about that. It's a compliment.